This seemingly unholy union has been coming for some time now. If there’s one thing to be said about 2016, it’s that it’s full of surprises. This year has seen events you wouldn’t have dreamt of a decade ago. When I read that Microsoft joined the Linux Foundation, I couldn’t believe it at first. There’s plenty of exciting news for developers in this new partnership, but not much for Linux desktop users. I first started experimenting with Linux in the late ’90s and early aughts (’00s? ), back when Steve Ballmer took the reins at Microsoft. In those days, Microsoft was famously hostile to Linux, or any other OS for that matter. Fast-forward 15 years, and Microsoft is cozying up to the very same platform that Ballmer had vilified. Under Satya Nadella, Microsoft has embraced the open-source scene. While I was surprised by the news, it didn’t exactly blow my hair back. Microsoft’s product line has been getting progressively more Linux-friendly over the past couple of years. You can spin up a Linux virtual machine in Microsoft’s Azure platform, just as easily as you can an image of Microsoft’s own IIS. Earlier this year, Microsoft partnered with Canonical (the company behind Ubuntu) to create the Windows Subsystem for Linux. In June, someone even got WSL to run Ubuntu’s Unity desktop in Windows 10. 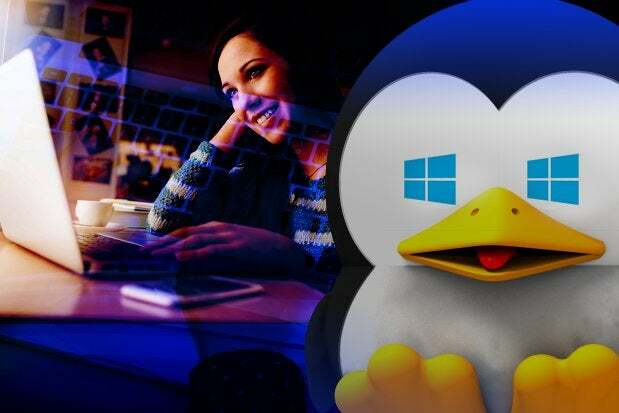 Microsoft is planning to release its SQL Server database for Linux as well. Microsoft CEO Satya Nadella recently proclaimed the company’s newfound love for Linux. None of that really affects everyday Linux users, but what will make a difference in the short term is the money Microsoft injected into the Linux Foundation. Microsoft joined as a Platinum member, which means that Nadella and company will pony up at least $500,000 for the title, per year. That money can help fund Linux Foundation projects, most of which (like Node.js) aren’t user-facing at all. However, a big recipient of the money will be the Linux kernel, so more resources and developer time can be spent on improving hardware support, security, and performance. Besides the kernel, the most likely consumer-facing project in the Linux Foundation to benefit will be the Tizen mobile operating system that Samsung (also a foundation member) is looking to use on its smartphones in place of Android. As with most corporate sponsorships in open-source, most of the money goes to projects that power infrastructure and web technologies that those companies rely on. Projects that create software that the desktop user uses every day (like GNOME or LibreOffice) are unlikely to see much, if any, of Microsoft’s money. It’s also fairly unlikely that Microsoft desktop applications will suddenly run on Linux or become more compatible, unless Microsoft starts paying some people to work on WINE full time. Being a member of the Linux Foundation doesn’t even ensure that a sponsor will continue previous support for the OS. Take Adobe, for example: Adobe pays $20,000 per year as a Silver member of the Linux Foundation. Adobe also stopped releasing updates for Flash to Linux four years ago. (The company just recently started supporting the OS again in September.) There still isn’t a Linux version of the Creative Suite, which means you still need Windows (or Mac OS) to run Lightroom, Photoshop, and the like. And Acrobat Reader for Linux, in my experience, has been bad to the point of near-uselessness. Given Adobe’s approach to Linux, I wouldn’t expect great things from Microsoft when it comes to the Linux desktop. If Redmond were to announce a release of DirectX for Linux, it might—might—just make 2016 better, but I won’t hold my breath.